Curd Nerd and me – cheese geeking out at The Dairy. That block of cheese is surprisingly heavy. 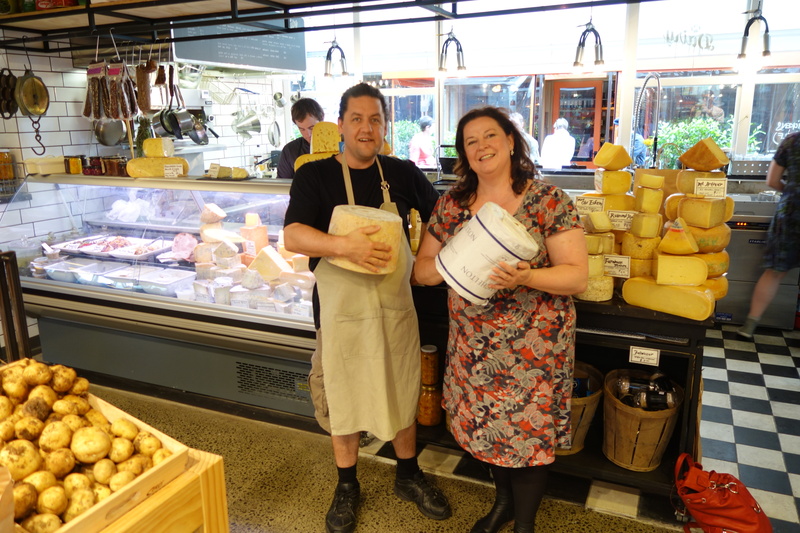 At last, a trip to the Dairy, no, not the corner store but Auckland’s latest specialty cheese shop. Headed by cheese afficionado Curd Nerd, this my dear friends is the cheesey shizzle. You gotta visit. 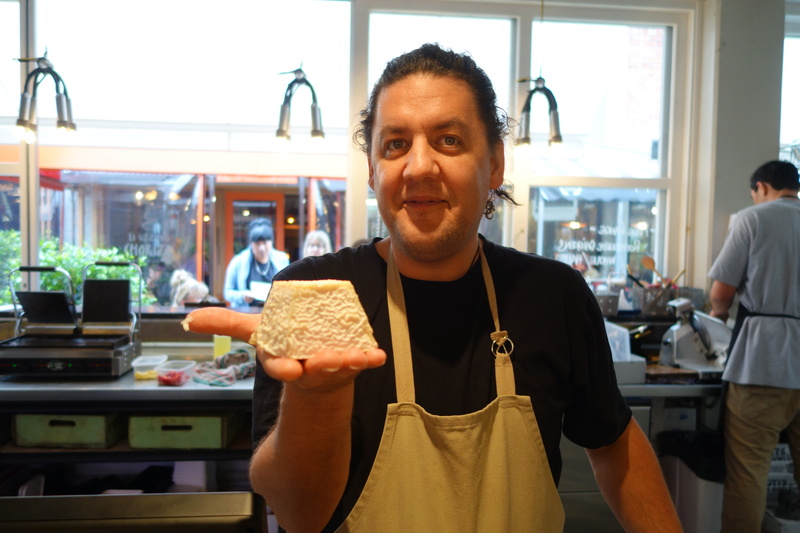 Curd Nerd in the cheeseroom – the cheese was damaged in the Christchurch earthquake – check out the NZ-shaped scar! Not just a cheese counter, there’s a room for aging cheese, you can get grilled cheese, hell they’re even brewing their own beer. These guys are seriously into cheese. And they’re not just selling artisan cheese but working with local cheesemakers to make fresher, stronger, stinkier cheeses. I was in cheesey nirvana as Curd Nerd scraped and sliced cheese after cheese, explaining how they are working with Mahoe to make a better Camembert. 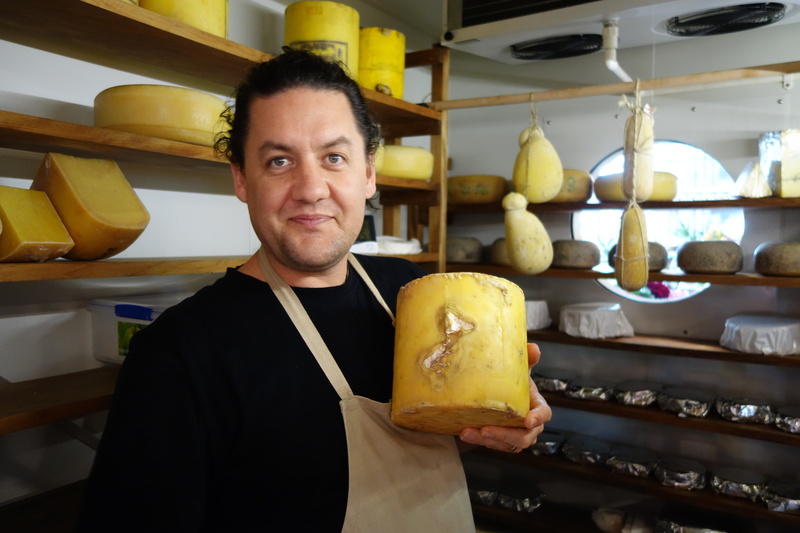 Mahoe are also bringing out New Zealand’s first Raclette, how Whangaripo Buffalo Cheese Co had made them a Geotrichum, a wrinkley-skinned pyramid. There was even a cheesemaker behind the counter with them, Miel from Meyer Cheese. 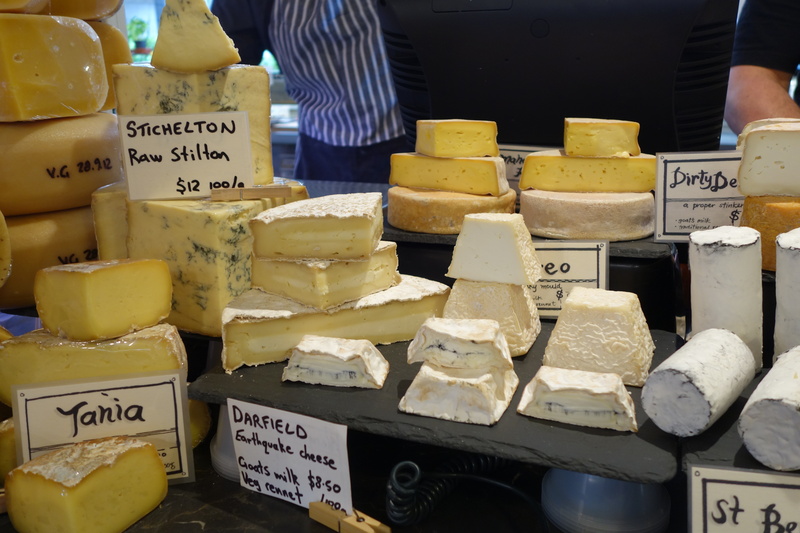 Some of the beautiful cheeses on offer, I loved the Stichelton and beatufiul tube of blue-grey goat’s cheese. And the best bit of all, he let me poke my nose into his cheese room. I breathed in that most intoxicating smell of musty, earthiness. Yum. To some it may smell like damp old socks, but to me it smelt like the future of New Zealand cheese. They aren’t afraid of mixing it up with the Brits too. So I got to taste Stichelton. Folks if you read cheese books like me, OK you don’t read cheese books like me, but if you did you’d know this is a superstar of British cheese. 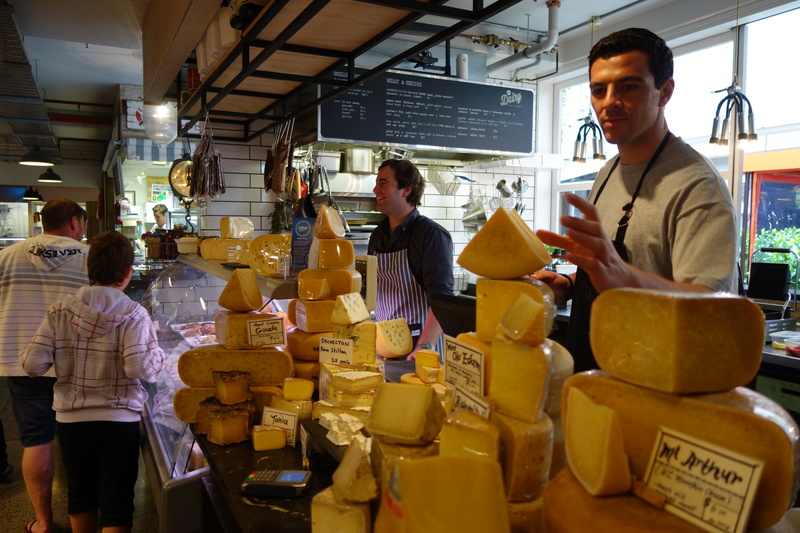 Make sure you ask these guy for tastes – they’re passionate about cheese. So cheesey friends, and even not so cheesey friends you must, must must go to the Dairy, summon up your courage if you are shy, and have a good old taste. These people love what they do, they are generous and passionate and keen to share. Ask for them for advice, tell them what you want. I needed a cheese for my beloved, and Curd Nerd suggested an Appleby Cheshire, rather than Red Leicester I knew his nibs would like. And Rog was delighted. Not only that in my bag of pongers was one just for him, but that I had got help to pick out something he would really love. And love it he did. You can find the Dairy on the corner of Ponsonby and Richmond Rd. I was way too excited to stop and take a photo of the outside, but you can’t miss it. Well done Curd Nerd and all your Curdy colleagues, you are stars. One batch to rule them all, One cheesemonger to find them, One cheesemaker to make them all, And then the public buy them. CheeseSolidarity! The Cheese Manifesto! I am a curd nerd, and this is my manifesto. You may stop this individual, but you can’t stop us all… after all, we’re all alike.